You are here: Home › Reach Out › Twitter Marketing › How Often Do Popular Creative Freelancers Tweet? How Often Do Popular Creative Freelancers Tweet? 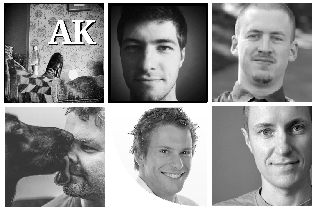 The most popular freelance graphic designers, illustrators, and web designers tweet in average 11 times per day. 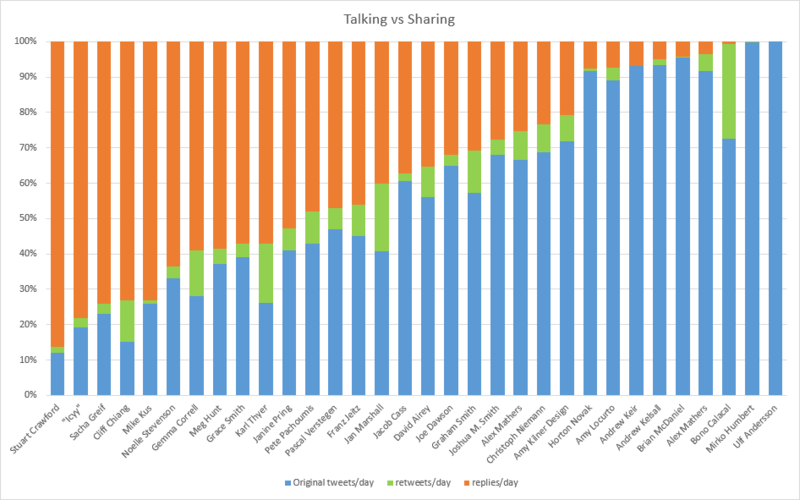 However, there are large differences in both the total number of daily tweets, and how those tweets are distributed between original tweets, retweets, and replies. 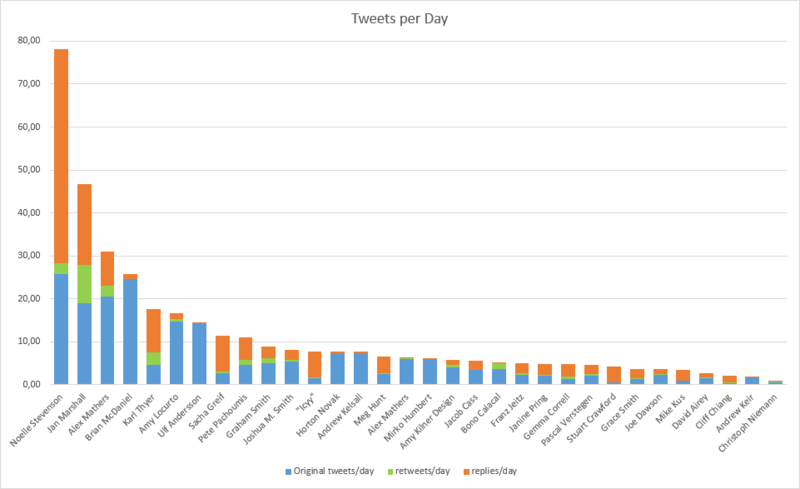 Even if two users may post the same total amount of tweets per day their Twitter “style” can differ a lot. Look at next chart! What does it show! To put it simple: The more orange, the more sociable. The more blue, the more of a news ticker. For example, a large part of Stuart Crawford's tweets are replies to others. He is a “talker”, using Twitter very much as a chat. On the other end of the spectrum we find Mirko Humbert, who is an extreme “sharer”. His Twitter stream almost entirely consist of tweets linking out to content he has found on the web. Mirko uses Twitter more as news ticker. The chart below shows the proportions between replies, retweets, and original tweets. Original tweets consist of shared links, comments, quotes etc originally posted by the creative freelancer himself. According to a Hubspot study it's pretty hard to overtweet. You should probably tweet more than you do. The study reported that the number of followers peaks when the user tweets around 22 times per day. Also, as someone attracts more followers they tend to tweet more often. For example, once someone has 1 000 followers the average number of tweets per day rise from 3 to 6, and when the user is closing in on 2 000 followers daily tweets climb to 10. Please let me know if you have any comments or questions below!